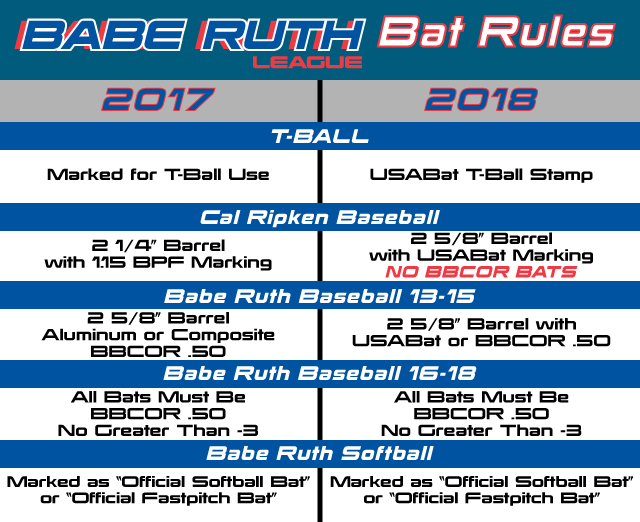 In 2017, the Cal Ripken / Babe Ruth League rules that govern the use of bats in our league were changed. These changes were made with intent of improving player safety. Many youth, high school, and collegiate baseball programs across the country have adopted similar measures for the same reasons. 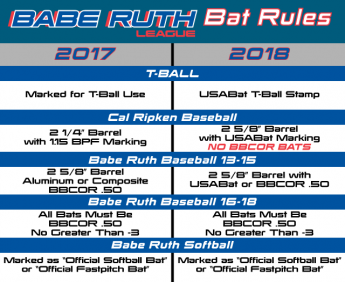 The Babe Ruth League rules that apply to bats used in our Cal Ripken / Babe Ruth and Seniors Divisions are provided below. Please note that these rules are subject to further change. We encourage you to review these rules if you plan to make individual baseball bat selections and purchases for players within your family. As you might expect, bats that do not meet these latest standards may be offered for sale at steep discounts. Despite the attractive purchase price, an ineligible bat or a bat with non-conforming dimensions should not be used for league practices or games at Mathewson McCarthy Baseball. The rules above that apply to Mathewson McCarthy Baseball may be different than those established for modified and high school baseball programs. Individuals selected for modified and high school teams may wish to consider consulting with the appropriate modified or high school program representative to determine the rules governing the use of bats for such school programs. If you have any questions regarding these rules, please contact us at info@mmbrb.org. Bats used at the Cal Ripken (4-12) level must have the "USA Baseball" (see below). Babe Ruth (13-15) may use USA Baseball approved or BBCOR rated bats. Seniors (16-18) must use BBCOR rated bats. Here is a graph outlining the bat rule changes effective for the 2018 season for each level of play at Mathewson McCarthy Baseball. Wood bats are permitted at each level.